I’d like to nominate Manny’s for the LTH Great Neighborhood Restaurant Program. Manny’s is a true Chicago Classic, and probably the last of its breed to survive (cafeteria style Jewish inspired deli food). The only other one that I know of, Francis’ Deli on Clark Street, survives in name only as the steam table disappeared long ago and the food is a shadow if its former self. Manny’s has been written about many times on LTH, and one of the first outings we had when the new board was organized was an outing to Manny’s for lunch. Below are a few threads about/mentioning Manny’s. Wouldn’t a nice corned beef sandwich go good right about now? Somehow I expect this to be a controversial nomination, Steve, in that there have always been those that point out, rightly, that Manny's is really not a great deli, just the best in Chicago. But that is not the point, or the criteria for this award. Manny's is more than a bit of anachronism. It is a style of restaurant (the cafeteria) that I believe surfaced in the 20's and thrived through the 50's, after which it has slowly disappeared because its primary advantage, being fast, was taken over by a whole other group of places. Of course, you find cafeterias here and there, but they are usually old, graying and look like they're on their last legs. Common among all of them is that the food is not very good. And the food, while never the absolute best of anything, is always good, plentiful and served with a nice side of attitude. The place is a classic. I have shared it with numerous people over the years, and have yet to get a complaint. Nice, choice by me, Steve. dicksond wrote: Manny's is more than a bit of anachronism. It is a style of restaurant (the cafeteria) that I believe surfaced in the 20's and thrived through the 50's, after which it has slowly disappeared because its primary advantage, being fast, was taken over by a whole other group of places. Of course, you find cafeterias here and there, but they are usually old, graying and look like they're on their last legs. dicksond wrote: And the food, while never the absolute best of anything, is always good, plentiful and served with a nice side of attitude. I've got to differ with you here. I think many of the dishes at Manny's are the best there is of their kind. I'm not necessarily talking about the corned beef/pastrami sandwiches which, like pizza, have differing points of view about what they should be. I'm talking about the home cooked comfort food. Almost any post I make about Manny's talks about the short ribs. Since my Grandmother died, I've yet to find a better version. The veal breast is to die for, cooked in the old world tradition and without peer. The same is true of several of the other dishes. Of course, like any restaurant, not every single dish is going to be the "best", but as you point out, Manny's is always at least good and more often than not great. Okay, I admit that I rarely used to get past the corned beef and pastrami because it was just about the only place around here I ever got it (Schmaltz's has changed that equation, BTW, for me), so you got me there Steve. But I suppose in my attempt to attain some form of even handed criticism, my main point may not have gotten across. I really like Manny's and so has everyone else I have ever taken there. Jim, as to the cafeteria being more common in Indiana and the south, I suppose that is true. As to the food being normally very good in cafeterias, you will need to go some to convince me of that, but I stand ready to be convinced! dicksond wrote: Jim, as to the cafeteria being more common in Indiana and the south, I suppose that is true. As to the food being normally very good in cafeterias, you will need to go some to convince me of that, but I stand ready to be convinced! More common, yes -- in the sense of "numerous," not in the sense of "ordinary." Talk to VI, but in the meantime, get your hands on a copy of the book "Tray Chic," which is a guide to the great cafeterias of Indiana (including among others Poe's, Gray Bros. and, of course, Shapiro's). And, of course, keep enjoying Manny's, because it's a very good cafeteria (if tiny by contemporary Hoosier and, I understand, Texan standards). Not ot get too OT, but are there any Texas listings in that book in the DFW area? No, the book Tray Chic only discusses Indiana cafeterias. But if you check out the following thread on LTHForum, you may get some ideas or learn who to ask about Texan cafeterias (e.g., JeffB or Christopher Gordon): http://lthforum.com/bb/viewtopic.php?p=23519#23519 That's where I learned about Luby's and the big Texas cafeteria tradition. If the question was ranking Manny's pastrami to Katz's in NYC, then yes, controvesial, but as a great restaurant, I don't think so. But I will say this, within a short span, I had corned beef at Manny's, Zingerman's and Jake's, and I liked Manny's the best. And it is not even my favorite thing at Manny's. Great roast beef tops their offerings. Things I especially like: the smelts, the mac and cheese, the highly un-orthodox knishes, the soups, the rice pudding/custard, the beets, the cucumber salad, the hamburgers, the reubens, the way over-cooked spaghetti, the fried fish, the oxtails, the stuffed peppers, the franks and beans...Gosh I should go soon to see what my list is missing. Vital Information wrote: Great roast beef tops their offerings. Yep; Manny's makes the best roast beef sandwich I've ever had and, I'd say the best roast beef sandwich imaginable. I just don't know how you could do better. (For a better grade of corned beef, and vastly superior rye bread, however, you can drive at 80 mph down I-65 and be at Shapiro's in about 3 hours ). Did somebody say roast beef? The only time I had smelts at Manny's was during the 24-hour Chowathon, and I was (I thought justly) castigated by Justjoan for ordering something like that at Manny's. The problem (or so I thought) was that they were fried, and then set to sit behind the glass until someone ordered them. As I recall, they were served at room temperature. Fresh out of the fryer, I'm sure they'd be fine...but how do you do that at Manny's. Anyhow, I think Manny's is deserving of recognition and would like to see them get a GNR placard. Well, David, we just disagree (on the smelts). stevez wrote: Almost any post I make about Manny's talks about the short ribs. Since my Grandmother died, I've yet to find a better version. For me it's a toss-up between pastrami/corned beef combo and plate lunch, unless it's Thursday and then, no question, Ox Tails, substitute kasha for potatoes please. Evil Ronnie, noted inventor of Clams with Black Bean Sauce Evil Ronnie style at 'Little' Three Happiness (clams/BB sauce/extra jalapeno on pan fried noodle), was the person who suggested the joy of substituting kasha for the included ox tail potato. Thanks Evil, great idea. 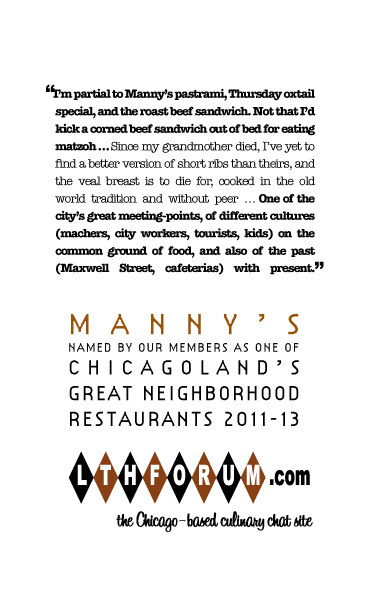 I agree with Mr. Z, Manny's deserves a LTHForum.com Great Neighborhood Restaurants award. I strongly second the nomination of Manny's for the L-GNR award. I've been a steady and highly satisfied customer for 10 years now. And I still haven't even tried the oxtails or the short ribs. After a typical Saturday morning in the office, I popped into Manny's today for a bit of relief. Reuben sandwich (a new one for me, pretty good but I think I'll stick with the roast beef), potato pancake, pickles and a Cel-Ray soda, plus some entertaining banter in the serving line, reminded me why Manny's deserves our attention and praise. A "second seconding" on this vote. By the way, I was reminded today of another reason this is a "Great Neighborhood" spot, namely the "Great" (or at least infamous) neighborhood -- a block north is De Koven and Jefferson, the former site of Mrs. O'Leary's barn (and current location of a monument and the Chicago Fire Department Training Academy). Great one-stop shopping for out of town visitors. Manny's is maybe not the best of its kind in the country, and maybe not even the best pastrami, corned beef, or roast beef sandwich in the city, but it's still one of my favorite places. I'll take a sandwich at manny's over a sandwich at Zingerman's any day, even with Zingerman's rye and a dessert of chocolate sourdough. Being able to sit and eat a pastrami sandwich surrounded by two old men talking about life as only old men can; a tableful of cops; a tableful of lawyers; and a rail-thin woman putting away a massive corned beef sandwich and a bowl of soup is an experience of which I'll never tire. And it's always a lot of fun bringing new people there -- especially those who've spent minimal time in big cities. gleam wrote: Manny's is maybe not the best of its kind in the country, and maybe not even the best pastrami, corned beef, or roast beef sandwich in the city, but it's still one of my favorite places. I'll take a sandwich at manny's over a sandwich at Zingerman's any day, even with Zingerman's rye and a dessert of chocolate sourdough. As an aside, where would you say had better corned beef sammy's? Vital Information wrote: As an aside, where would you say had better corned beef sammy's? I haven't -- I'm not a real corned beef person. Hence "maybe"
Well, would not it be fair to wonder when you said "maybe not the best corned beef", what was on your mind? In fact I am a fan of Manny's only for their atmosphere, though I have yet to try the short ribs or the roast beef, both of which sound, and look, fantastic. Just want to make it clear that I'm not at all opposed to Manny's inclusion as a GNR, but would warn people, as we always do, not to expect it to be a New York, or even a Milwaukee, deli. Jake's is great and all, no argument here, but if we are now comparing Manny's to Jake's it would seem the continuing expansion of what makes a Great Neighborhood Restaurant simply knows no bounds. I still consider Wisconsin a friendly neighbor to the north, but fairly certain that doesn't place it in my neighborhood. Kman wrote: Jake's is great and all, no argument here, but if we are now comparing Manny's to Jake's it would seem the continuing expansion of what makes a Great Neighborhood Restaurant simply knows no bounds. I still consider Wisconsin a friendly neighbor to the north, but fairly certain that doesn't place it in my neighborhood. Although, for what its worth, based ONLY on one visit to Jake's, I found I liked the corned beef at Manny's better. But if there was some secret source of great corned beef out there, that Ed was keeping to himself, I wanted to know! In my admittedly limited experience, locating the secret source of great corned beef has always involved an airline ticket to New York. So much for my skills at nuance and contingency. Allow me to be the first to encourage Manny's re-approval as a Great Neighborhood Restaurant, since I was just there last Saturday and enjoyed, thoroughly and unreservedly, my pastrami, my wife's roast beef sandwich, and the potato pancakes and pickles-- not to mention the Manny's vibe, on which more below. We can debate whether this or that thing at Manny's is better, or even compares, to the same thing elsewhere. I would grant that at their peaks, corned beef is better in New York and pastrami better in LA, and still say that Manny's is great. First of all, unless one is selecting for one's last meal, one is likely to eat more than one pastrami or corned beef sandwich in one's life. Manny's is an outlier on the spectrum of pastrami, heavily salted and cured, almost to the point that one cannot tell what the meat was originally; a far cry from, say Shapiro's, where the pastrami tastes of brisket lightly cured. But all that means is that Manny's has its own style, which is surely what we want, and one should enjoy it for what it is, not fault Verdi for not being Chopin, Jimmy Caras for not being Ralph Greenleaf. But the joy of Manny's transcends the individual dish. It is one of the city's great meeting-points, of different cultures (machers, city workers, tourists, kids, retirees) on the common ground of food, and also of past (Maxwell Street, Jewtown, 20th century cafeteria dining) with present (the ongoing spread of Yuppieville). From a Chicago heritage and history standpoint, I would dynamite a dozen Louis Sullivan buildings (not that that isn't practically happening anyway) before losing Manny's. It is one of the first places I take visitors from out of town (assuming they're coming from a deli-deprived part of the world), and based not just on my ongoing affection but on the meal only recently picked from my teeth, I affirm that it is, as Talking Heads would say, same as it ever was. If I'm in the neighborhood I always stop for a corned beef or pastrami to go -- don't have to be hungry! If I have time to stay, I'll usually get one of their specials, always homey -- and then get a corned beef or pastrami to go! Mike G wrote: But the joy of Manny's transcends the individual dish. It is one of the city's great meeting-points, of different cultures (machers, city workers, tourists, kids, retirees) on the common ground of food, and also of past (Maxwell Street, Jewtown, 20th century cafeteria dining) with present (the ongoing spread of Yuppieville). Permit me to illustrate your point, Mike. When some of the Roundtable folks gathered at Manny's on Monday, we were seated next to mayoral candidate "Dock" Walls and some gentlemen who appeared to be his campaign staff. I was curious as to why Mr. Walls was not taking the opportunity to shake hands on the last day before the election. Stevez explained that Manny's is a kind of neutral territory for lots of Chicago notables, where an unwritten rule exists so that everyone can eat there in peace. I've enjoyed the corned beef for a long time, but it wasn't until this week that I truly understood Manny's. Support the re-approval? Did you really have to ask? Mike G wrote: ......and based not just on my ongoing affection but on the meal only recently picked from my teeth, I affirm that it is, as Talking Heads would say, same as it ever was. Agreed, and good as it ever was is very good indeed. I'm partial to Manny's pastrami, Thursday Oxtail special, sub kasha mit bowties for potatoes please, and the roast beef sandwich. Not that I'd kick a corned beef sandwich out of bed for eating matzo.